“Orangeroot” redirects here. For other uses, see Orange-root. Goldenseal (Hydrastis canadensis), also called orangeroot or yellow puccoon, is a perennial herb in the buttercup family Ranunculaceae, native to southeastern Canada and the eastern United States. It may be distinguished by its thick, yellow knotted rootstock. The stem is purplish and hairy above ground and yellow below ground where it connects to the yellow rhizome. Goldenseal mostly reproduces clonally through the rhizome. The plant bears two palmate, hairy leaves with 5–7 double-toothed lobes and single, small, inconspicuous flowers with greenish-white stamens in the late spring. In summer, it bears a single berry the size of a large raspberry with 10–30 seeds. It is most known due to its use in traditional medicine. However, there is currently insufficient evidence to determine if goldenseal has a justifiably good therapeutic index for any conditions. Research into the efficacy of goldenseal for a variety of uses is ongoing. In herbalism, goldenseal’s roots and rhizomes have been historically harvested and claimed to be a safe and effective multi-purpose remedy. Currently, some herbalists who support the use of goldenseal claim the herb’s efficacy is due to high concentrations of berberine and hydrastine. The herb is believed to possess some measure of anti-inflammatory, anti-diarrheal, antibacterial, and immune system-enhancing properties. Goldenseal is used to purportedly control muscle spasms, treat cancer, stimulate the heart and increase blood pressure, treat gastrointestinal disorders, treat conjunctivitis, manage painful and heavy menstruation, treat infections topically, reduce swelling and alleviate edema. Goldenseal may be purchased in salve, tablet, tincture form or as a bulk powder. It is often used to boost the medicinal effects of other herbs with which it is blended or formulated. A second species from Japan, previously listed as Hydrastis palmatum, is now usually classified in another genus, as Glaucidium palmatum. According to the American Cancer Society, “evidence does not support claims that goldenseal is effective in treating cancer or other diseases. Goldenseal can have toxic side effects, and high doses can cause death.” Even though not enough research has been completed to determine the plant’s efficacy, some experiments have shown that goldenseal is effective at reducing infection[which?] and potentially useful in the prevention and treatment of MRSA (Methicillin-Resistant Staphylococcus Aureus). Although the 2012 article, “Quorum Quenching and Antimicrobial Activity of Goldenseal (Hydrastis canadensis) against Methicillin-Resistant Staphylococcus aureus (MRSA)”, found evidence of efficacy (“a demonstrated quorum-quenching activity against several clinically-relevant MRSA isolates (USA300 strains)”) it did not evaluate the toxicity of goldenseal or consider the therapeutic index. Herbalist Paul Bergner investigated the research and has been unable to find case reports in which levels of intestinal pathogens were lowered after taking goldenseal. A study in which men with E. coli–induced diarrhea had 42–48% reduced symptoms after taking berberine showed unchanged levels of intestinal bacteria, pathogenic or otherwise, after taking goldenseal. It appears likely that goldenseal shares with Mahonia (Oregon grape) and Berberis (barberry) the ability to inhibit the drug resistance MDR pumps of bacteria. At the time of the European colonization of the Americas, goldenseal was in extensive use among certain Native American tribes of North America, both as a medicine and as a coloring material. Benjamin Smith Barton, in his first edition of Collections for an Essay Toward a Materia Medica of the United States (1798), refers to the Cherokee use of goldenseal as a cancer treatment. Later, he calls attention to its properties as a bitter tonic, and as a local wash for ophthalmia. It became a favorite of the Eclectics from the time of Constantine Raffinesque in the 1830s. Tribes also used goldenseal for digestive issues, as an eyewash, as a diuretic and as a bitter. Dr. John Henry Pinkard, a noted “Yarb Doctor” and producer of medicines in Roanoke, Virginia, during the 1920s and 1930s, had a variety of remedies that he prepared and sold out of his drugstore and shipped across the country. Some of the names were: “Pinkard’s Hydrastic Compound” (evidently made from goldenseal or Hydrastis canadensis), “Pinkard’s Great Liniment” and “Pinkard’s Sanguinaria Compound” (made with Sanguinaria). Many of his potions were based on herb lore taken from traditional slave and rural Virginia medical practices and local tribal remedies. Goldenseal contains the isoquinoline alkaloids hydrastine, berberine, berberastine, hydrastinine, tetrahydroberberastine, canadine and canalidine. A related compound, 8-oxotetrahydrothalifendine, was identified in one study. The United States Pharmacopoeia requires goldenseal sold as a supplement to have hydrastine concentrations of at least 2% and berberine concentrations of at least 2.5%. The requirements in Europe are that hydrastine concentrations be at least 2.5% and that berberine concentrations at least 3%. The hydrastine concentrations of goldenseal plants range between 1.5% and 5%, while the berberine concentrations are usually between 0.5% and 4.5%. Goldenseal is harvested for its rhizomes because the concentrations of hydrastine and berberine in the shoots do not meet these requirements. Berberine and hydrastine act as quaternary bases and are poorly soluble in water but freely soluble in alcohol. The herb seems to have synergistic antibacterial activity over berberine in vitro, possibly as a result of efflux pump inhibitory activity. Multiple bacteria and fungi, along with selected protozoa and chlamydia, are susceptible to berberine in vitro. Berberine alone has weak antibiotic activity in vitro since many microorganisms actively export it from the cell (although a whole herb is likely to work on the immune system as well as on attacking the microbes and hence have a stronger clinical effect than the antibiotic activity alone would suggest). There is some evidence for other berberine-containing species synthesizing an efflux pump inhibitor that tends to prevent antibiotic resistance, a case of solid scientific evidence that the herb is superior to the isolated active principle. However, it is not yet known whether goldenseal contains a drug resistance MDR pump inhibitor, although many antimicrobial herbs do. California is proposing to list goldenseal root powder as a carcinogen. powder. Berberine in humans can cause blocking of receptors in smooth muscle, blocking potassium channels in the heart and reducing ventricular tachycardia, inhibiting intestinal ion secretion and toxin formation in the gut and increasing bile secretion. While goldenseal, like all alkaloid-rich herbs including coffee and tobacco, should be avoided during pregnancy and given to very young children with care, it appears that goldenseal is unlikely to be toxic in normal doses. Interactions with drugs with narrow therapeutic windows like warfarin, ciclosporin, protease inhibitors and cardiac glycosides are potential concerns. Side effects of goldenseal may include “digestive complaints, nervousness, depression, constipation, rapid heartbeat, diarrhea, stomach cramps and pain, mouth ulcers, nausea, seizures, vomiting, and central nervous system depression. High doses may cause breathing problems, paralysis, and even death. Long-term use may lead to vitamin B deficiency, hallucinations, and delirium.” In addition, goldenseal may cause brain damage to newborn babies if given directly or if taken by breastfeeding or pregnant mothers, and may affect blood pressure unpredictably because it contains several compounds that have opposite effects on blood pressure. Taking goldenseal over a long period of time can reduce absorption of B vitamins, but it is cautioned to avoid goldenseal during pregnancy and lactation, with gastrointestinal inflammation and with pro-inflammatory disorders. A 2011 study found rats fed goldenseal constantly for two years had a greater tendency to develop tumors. Goldenseal has been found to have inhibited cytochrome P450 CYP2D6, CYP3A4 and CYP3A5 activity by approximately 40%, a statistically and clinically significant reduction. CYP2D6 is a known metabolizer of many commonly used pharmaceuticals, such as antidepressants (including all SSRIs except for fluvoxamine), neuroleptics and codeine. Combining goldenseal with such medications should be done with caution and under the supervision of a doctor as it can lead to serious, perhaps fatal, toxicity. Those with a genetic deficiency in these enzymes are at particular risk. 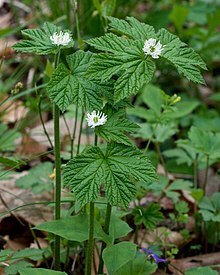 Goldenseal became a part of American folklore associated with chemical-testing errors as a result of pharmacist John Uri Lloyd‘s 1900 novel Stringtown on the Pike. In the book, the victim’s habit of taking goldenseal in the form of digestive bitters causes the herb to appear as the poison strychnine in a chemical test, thus suggesting murder. Goldenseal has been unsuccessfully used in recent years in attempts to mask the use of morphine in race horses. Two studies have failed to demonstrate any effect of oral goldenseal on urine drug assays over water alone. Subjects who drank large amounts of water had the same urine drug levels as subjects who took goldenseal capsules along with the water. Goldenseal became popular in the mid-nineteenth century. By 1905, the herb was much less plentiful because of overharvesting and habitat destruction. Wild goldenseal is listed in Appendix II of the Convention on International Trade in Endangered Species of Wild Fauna and Flora (CITES), which by definition means harvest from public land is prohibited and may require a permit to export, although trade of the plants is not deemed to be detrimental to the wildlife population and is otherwise unregulated. The U.S. Fish and Wildlife Service recommends that diggers and harvesters track sales and harvests and prove legality of all harvests. Canada, as well as 17 of the 27 U.S. states where goldenseal grows natively, have declared it as threatened, vulnerable or uncommon. More than 60 million goldenseal plants are picked each year without being replaced. Although goldenseal’s geographical range is wide, it is found in small quantities in these habitats. The core of the herb’s range is in the Ohio River Valley, but its population there has decreased by almost half. The process of mountain top removal mining has recently put the wild goldenseal population at major risk from loss of habitat. Many herbalists urge caution in choosing products containing goldenseal, as they may have been harvested in an unsustainable manner rather than having been organically cultivated. There are several berberine-containing plants that can serve as useful alternatives, including Chinese coptis, yellowroot or Oregon grape root. Research completed by Albrecht and McCarthy shows that when goldenseal is harvested in the fall season, it has a faster population recovery than with midsummer harvests. However, a study by Douglas et al. showed that goldenseal has the highest concentrations of hydrastine and berberine in the early summer. Their research also showed that three to five years of growth will yield the highest concentration of alkaloids in the plant. Two experiments done by Sinclair and Catling on the effects of soil turnover, fertilization and transplanting of goldenseal show that disturbances actually benefit the growth of goldenseal. The results from the first growing season of the experiment showed that soil turnover and fertilization combined show the greatest increase in plant biomass, while the results after two growing seasons showed that this group also yielded the highest proportion of flowering plants, fruit production and seed production. Both experiments also showed that soil disturbances benefit the growth of goldenseal. As of 1998, only 2.4% of goldenseal plant material originated from a cultivated source rather than wild harvest, although that number was projected to rise by 15–30% over the next several years. In response to conservation concerns, research has expanded regarding the propagation success of wild plant material for commercial yield. Because goldenseal grows in patches of interconnected ramets reproducing asexually through clonal propagation, transplanting rhizome propagules into cultivated settings is possible. Seed propagation is also feasible and has advantages such as lower cost and greater genetic variability, but is considered difficult and unpredictable. Goldenseal may be commercially cultivated through agroforestry in natural settings mirroring the plant’s ecological environment, or on farms with artificial shade canopies. Another propagation method of goldenseal utilizes a controlled environment such as a greenhouse growing lab where the plant’s environmental needs such as light, water and temperature are artificially simulated. Crop selection and biotechnology experimentation may be employed to increase yield and pharmacological potency. Controlled environments can greatly reduce the amount of time required to grow goldenseal to its desired harvestable state. While forest-cultivated plants double in mass every three to fiveyears, plants can double in mass every 15 weeks in growth chambers and triple in growth when in a course soil medium. Subculturing can take place every 30 days to mass-propagate the plant. Another option is cultivating goldenseal in new regions. An experiment conducted by Douglas et al. grew goldenseal over a six-year period in a warm, temperate environment in New Zealand. The yields were 74% higher in the sixth year of growth compared to the fourth year of growth, which is when goldenseal is normally harvested. The overall growth of the allochthonous goldenseal was comparable to that found in the United States, and the hydrastine and berberine concentrations were within the American and European standards. Cultivating goldenseal in a New Zealand environment that is similar to its home range is an option to maintain its population. ^ a b “Hydrastis canadensis“. Germplasm Resources Information Network (GRIN). Agricultural Research Service (ARS), United States Department of Agriculture (USDA). Retrieved 2017-12-12. ^ a b c Christensen, Deanna; Gorchov, David (2010). “Population dynamics of goldenseal (Hydrastis canadensis) in the core of its historical range”. Plant Ecology. 210: 195–211. ^ a b Goldenseal, WebMD. ^ Goldenseal, NYU Langone Medical Center. ^ a b c d Mahady, Gail; Chadwick, Lucas (2001). “Goldenseal (Hydrastis canadensis): Is there enough scientific evidence to support safety and efficacy?”. Nutrition in Clinical Care. 4: 243–249. ^ “Goldenseal | Memorial Sloan Kettering Cancer Center”. Mskcc.org. Retrieved 2017-02-20. ^ a b c Goldenseal, American Cancer Society. ^ Clement-Kruzel, Kruzel; Hwang, SA; Kruzel, MC; Dasgupta, A; Actor, JK (2008). “Immune Modulation of Macrophage Pro-Inflammatory Response by Goldenseal and Astragalus Extracts”. J. Med. Food. 11: 717–720. ^ Egan, Joseph; Kaur, Amninder; Raja, Huzefa; Kellogg, Joshua; Oberlies, Nicholas; Cech, Nadja (2016). “Antimicrobial fungal endophytes from the botanical medicine goldenseal (Hydrastis canadensis)”. Phytochem Lett. 17: 219–225. ^ a b Cech, NB; Junio, HA; Ackermann, LW; Kavanaugh, JS; Horswill, AR (2012). “Quorum quenching and antimicrobial activity of goldenseal (Hydrastis canadensis) against Methicillin-Resistant Staphylococcus aureus (MRSA)”. Planta Medica. 78: 1556–1561. ^ Rabbani GH, Butler T, Knight J, Sanyal SC, Alam K (May 1987). “Randomized controlled trial of berberine sulfate therapy for diarrhea due to enterotoxigenic Escherichia coli and Vibrio cholerae”. The Journal of Infectious Diseases. 155 (5): 979–84. doi:10.1093/infdis/155.5.979. PMID 3549923. ^ Barton, Benjamin. “Benjamin Smith Barton MD – Collections for an Essay Towards a Materia Medica of the United States (p. 8)”. Nlm.nih.gov. Retrieved 2017-02-20. ^ “Ozark Encyclopedia – G – Goldenseal”. Ozarkhealingblog.com. 29 August 2017. Retrieved 16 March 2019. ^ Weber HA, Zart MK, Hodges AE, et al. (December 2003). “Chemical comparison of goldenseal (Hydrastis canadensis L.) root powder from three commercial suppliers”. Journal of Agricultural and Food Chemistry. 51 (25): 7352–8. doi:10.1021/jf034339r. PMID 14640583. ^ Gentry EJ, Jampani HB, Keshavarz-Shokri A, et al. (October 1998). “Antitubercular natural products: berberine from the roots of commercial Hydrastis canadensis powder. Isolation of inactive 8-oxotetrahydrothalifendine, canadine, beta-hydrastine, and two new quinic acid esters, hycandinic acid esters-1 and −2”. Journal of Natural Products. 61 (10): 1187–93. doi:10.1021/np9701889. PMID 9784149. ^ a b c d e Douglas, JA; Follett, JM; Waller, JE; Sansom, CE (2010). “Seasonal variation of biomass and bioactive alkaloid content of goldenseal, Hydrastis canadensis”. Fitoterapia. 81: 925–928. ^ Lewis K (April 2001). “In search of natural substrates and inhibitors of MDR pumps”. Journal of Molecular Microbiology and Biotechnology. 3 (2): 247–54. PMID 11321580. ^ “Developmental Toxicity Evaluation for Goldenseal (Hydrastis canadensis) Root Powder Administered in the Feed to Swiss (CD-1) Mice on Gestational Days 6–17”. Archived from the original on 2008-09-21. Retrieved 2008-07-13. ^ a b “Welcome to the Natural Medicines Research Collaboration”. Naturalmedicines.therapeuticresearch.com. Retrieved 16 March 2019. ^ Mills Simon and Bone Kerry (2000): Principles and Practice of Phytotherapy. Philadelphia, Churchill Livingstone. ^ Gurley BJ, Gardner SF, Hubbard MA, Williams DK, Gentry WB, Khan IA, Shah A (2005). “In vivo effects of goldenseal, kava kava, black cohosh, and valerian on human cytochrome P450 1A2, 2D6, 2E1, and 3A4/5 phenotypes”. Clin. Pharmacol. Ther. 77: 415–26. doi:10.1016/j.clpt.2005.01.009. PMC 1894911. PMID 15900287. ^ “Interaktion mellan läkemedel – FASS Vårdpersonal”. Fass.se. Retrieved 16 March 2019. ^ Zackrisson, A.L. ; Holmgren, P.; Gladh, A.B. ; Ahlner, J.; Lindblom, B. (October 2004). “Fatal intoxication cases: cytochrome P 450 2D6 and 2C19 genotype distributions”. European Journal of Clinical Pharmacology. Springer-Verlag. 60 (8): 547–552. doi:10.1007/s00228-004-0800-x. ISSN 1432-1041. ^ “Goldenseal, Goldenseal root, Goldenseal photos, Goldenseal article, Hydrastis canadensis photos, article by Steven Foster”. Stevenfoster.com. Retrieved 16 March 2019. ^ a b c Robbins, C.S., 2000. Comparative analysis of management regimes and medicinal plant trade monitoring mechanisms for American ginseng and goldenseal. Conservation Biology, 14(5), pp.1422–1434. ^ “United Plant Savers, Goldenseal”. Unitedplantsavers.org. ^ Dworkin, Norine (1999). “Where Have All the Flowers Gone? – herbal supplements threaten some herb species”. Vegetarian Times. ^ Mulligan, Margaret; Gorchov, David (2004). “Population loss of goldenseal, Hydrastis canadensis L. (Ranunculaceae) in Ohio”. Journal of the Torrey Botanical Society. 131: 305–310. ^ a b Albrecht, M.A. and McCarthy, B.C., 2006. Comparative analysis of goldenseal (Hydrastis canadensis L.) population re-growth following human harvest: implications for conservation. The American midland naturalist, 156(2), pp.229–236. ^ a b c Sinclair, Adrianne; Catling, Paul (2003). “Restoration of Hydrastis canadensis by transplanting with disturbance simulation: results of one growing season”. Restoration Ecology. 11: 217–222. ^ a b c Sinclair, Adrianne; Catling, Paul (2004). “Restoration of Hydrastis canadensis: experimental test of a disturbance hypothesis after two growing seasons”. Restoration Ecology. 12: 184–189. ^ Predny, M.L. and Chamberlain, J.L., 2005. Goldenseal (Hydrastis canadensis): an annotated bibliography. Gen. Tech. Rep. SRS-88. Asheville, NC: US Department of Agriculture, Forest Service, Southern Research Station. 67 p., 88. ^ Van der Voort, M.E., Bailey, B., Samuel, D.E. and McGRAW, J.B., 2003. Recovery of populations of goldenseal (Hydrastis canadensis L.) and American ginseng (Panax quinquefolius L.) following harvest. The American Midland Naturalist, 149(2), pp.282–292. ^ a b Davis, Jeanine M. (1999). ““Forest Production of Goldenseal““. Agroforestry Notes (USDA-NAC). 15. ^ a b Burkhart, E.P. and Jacobson, M.G., 2009. Transitioning from wild collection to forest cultivation of indigenous medicinal forest plants in eastern North America is constrained by lack of profitability. Agroforestry systems, 76(2), pp.437–453. ^ Canter, P.H., Thomas, H. and Ernst, E., 2005. Bringing medicinal plants into cultivation: opportunities and challenges for biotechnology. TRENDS in Biotechnology, 23(4), pp.180–185. ^ Adelberg, J., Salido, A., Kelly, R.M. and Beavers, R., 2016. Rapid Growth of High Quality Goldenseal Plants in Controlled Environment Growth Chambers. In Medicinal and Aromatic Crops: Production, Phytochemistry, and Utilization(pp. 65–74). American Chemical Society. ^ Bedir, E., Lata, H., Schaneberg, B., Khan, I.A. and Moraes, R.M., 2003. Micropropagation of Hydrastis canadensis: Goldenseal a North American endangered species. Planta medica, 69(01), pp.86–88. ^ a b c d Douglas, JA; Follett, JM; Waller, JE; Sansom, CE (2013). “Root and rhizome production of goldenseal (Hydrastis canadensis L.) under cultivated conditions in New Zealand”. New Zealand Journal of Crop & Horticultural Science. 41: 32–40. Blanchan, Neltje (2005). Wild Flowers Worth Knowing. Project Gutenberg Literary Archive Foundation. ISBN 0-665-98934-2.